Several Kokomo holiday light displays will open starting on Thanksgiving weekend. A great activity to do with friends, family, and kids! Highland Park’s “City of Lights” will come alive on Thanksgiving night with nearly 50 holiday light displays. Lights will remain on nightly at dusk through the end of the year. You can also see Santa at Highland Park until December 24. Another fun holiday tradition! 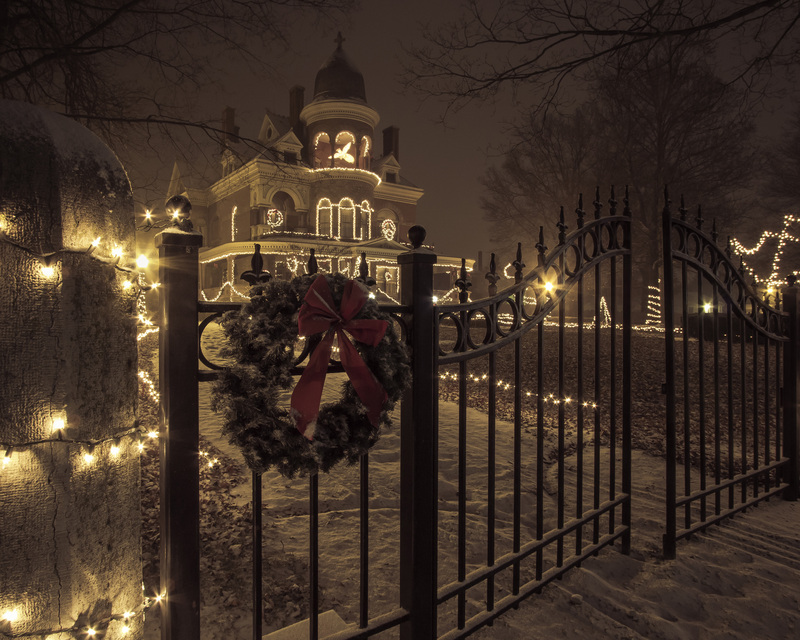 “Christmas at the Seiberling” starts Saturday, November 28, 2015 with a lighting ceremony at 6 p.m. followed by music, visits with Santa, and of course, tours of the stunning (and magnificently decorated) Seiberling Mansion. See thousands of lights and dozens of Christmas trees! Visitors 12 and younger can compete for a prize in the “Count the Trees” contest! “Christmas at the Seiberling” continues through December 31. Downtown Kokomo’s Lighting Ceremony of the Courthouse Square starts Friday, December 4, 2015 (during FIRST FRIDAY!) Stroll through the downtown district from 5:30-9:00 p.m. to see holiday lights and local businesses competing in the window decorating contest. Kids can visit with Santa, carriage rides will be available, and local businesses will be open for holiday shopping! In this busy season of shopping, baking, and holiday errands, take some time to relax and enjoy the lights! There is a “TREEmendous Christmas” coming to the Seiberling Mansion, and the holiday celebration begins on November 28th. The Victorian elegance of the Seiberling Mansion is a perfect setting for a stunning collection of holiday trees, wreaths and garlands, and more. The Seiberling will be closed from November 14-28, 2015 to let the decorators do their magic. In the meantime, you can purchase advance tickets and make plans to start the holidays with your family at the Seiberling Lighting Ceremony on November 28th, sponsored by The Wyman Group. Witness the official arrival of Santa and join the countdown to 6:00 pm, when the glorious display of outdoor lights is illuminated. After the lighting, enjoy live music from the Kokomo Men of Note and the Kokomo Brass. 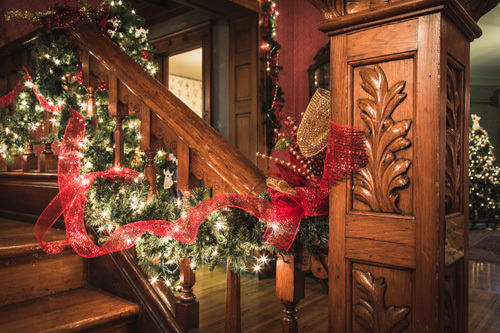 Inside the Seiberling, you’ll tour a vision of holiday beauty. Get some ideas for your tree, and marvel at the dozens of trees in twenty rooms on all three floors of the mansion. Vote for your favorite tree and help pick the People’s Choice. Visit the Elliott House to warm up with cookies and wassail and give the kids and grandkids a chance to chat with Santa. Take a picture with Santa and make some memories – but be sure to bring your camera! Opening night tickets are available in advance for $7.00 or at the door for $10.00. Kids 12 and under are $3.00 and Howard County Historical Society members are free. Purchase advance tickets online at howardcountymuseum.org. Along with your tour, you can schedule a carriage ride through the Old Silk Stocking District. Reservations are required by calling 765.452.4314. The price is $50 and includes up to six people. Make it a romantic trip for two – or a great memory for the kids and grandkids. Schedule your ride for November 28th between 6:00 and 9:00 pm, following the lighting ceremony. 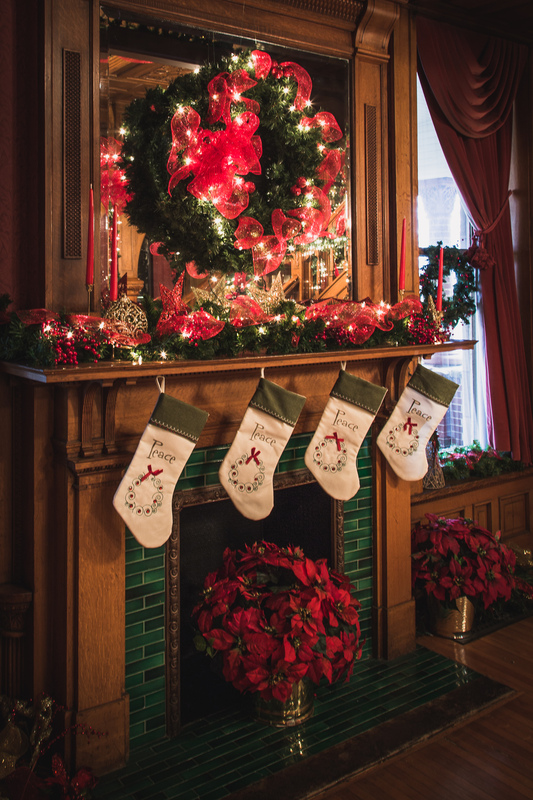 Christmas at the Seiberling tours will continue through December 31, 2015 from 1-4 p.m. Tuesday-Sunday (closed Dec. 24-26.) Group tours can be scheduled by appointment. Thanks to local sponsors, the Seiberling will also be open for special evening hours (and FREE admission) from 4-8 p.m. only on the following dates: December 3-4, 10-11, and 17-18, 2015. The Seiberling Mansion and Elliott House are located in the 1200 block of West Sycamore Street in Kokomo. Parking lots are accessible via Walnut Street, behind the mansion. For more information, call 765.452.4314 or visit their website and Facebook page.